We're often asked what we think is the best way to cook a Crayfish. But first let's cover the slippery territory of nomenclature. 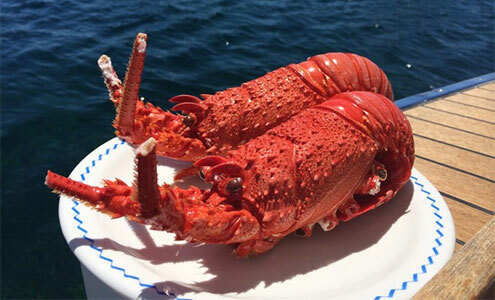 The official name for this great big delicious local red sea monster caught in the waters of Victoria is Southern Rock Lobster, Jasus Edwardsii. But most everyone around here just calls our soon to be murdered other invited guest a Cray. Okay, so now that you've caught your own Cray it's time to look at how you can cook it. There are many different ways that you can prepare Crayfish, and many different recipes. Here we will look at the main methods but this is certainly just the beginning of how you can prepare them, it really depends on how adventurous you feel. Many Cray lovers say that Crayfish is best eaten whole and steamed. However, you can also cook your Crayfish and use the meat to make sandwiches, salads, soups, risottos and a large number of other varied dishes. Before we begin we will quickly cover the most humane method to kill your Crayfish before starting cooking. A lot of people consider boiling a Crayfish alive to be inhumane and cruel. Other people believe that the nervous system of a Crayfish is too simple for it to feel any pain at all, similar to insects. This subject remains a topic of controversy, still to this day. Studies have been carried out by a number of researchers and universities to determine the most humane method of cooking Crayfish. Various methods of relaxation techniques were carried out prior to boiling and the lowest number of tail flicks upon insertion into the boiling water was thought to mean that the Cray felt less pain. It was found that the best way to minimise the tail movements of the Crayfish upon boiling is by placing the Crayfish in the freezer for a period of 5 to 10 minutes in order to numb the Cray before cooking. Unfortunately this method still involves putting live Crayfish into a heated pot which in our opinion isn't humane for the Crayfish. In our experience, we have found the simplest method and certainly the most humane method is to place the Crayfish into a container of water. Salt water is preferred however fresh water will also suffice. By doing this and leaving the Crayfish for around 30 minutes you actually "drown" the Cray. What happens is that the water has a limited amount of oxygen in it which the Crayfish will breathe. As the levels of oxygen decrease, the Crayfish are slowly and painlessly put to sleep by the buildup of CO2 levels. We have also found regularly when using this method that the Crayfish become so relaxed that they lose control of their bowels and pass what remains in them as they fall asleep (it doesn't always happen however). This has a great advantage of making the Crayfish much cleaner for the plate as well. Just remember to thoroughly wash the Crayfish down before proceeding to the next step of cooking them. Remember when you use this step, the more water you put into the container the longer it will take to drown the Crays, so just enough to cover them is best, but no more. This is by far the most humane method we know of. Which Parts of a Crayfish Can You Eat? The majority of the Cray's meat is found in the tail and in the two front claws. Smaller amounts of meat can also be found in the legs, antenna and in some parts of the body. Parts which should not be eaten are the shell, the sac behind the eyes, the black vein running through the tail and the green tomalley, although this is debatable, as some Cray eaters claim this to be the best part. Regardless of whether you steam, boil or blanch your Crayfish, salted water should be used. How salted should the water be? Well the best salted water medium is clean seawater, but an 8 per cent solution of salt and rainwater will do just fine. That's 80 grams of salt per litre of water. Steaming is considered by some purists as the only way to cook your Crayfish and retain all of the magnificent flavour available. Steaming is a more gentle process of cooking the meat and it preserves more flavour and tenderness. Steaming a Crayfish is also more forgiving on the chef since it is harder to over cook a Cray in a steam pot. For true Cray lovers, steaming is the way to go. Some people like to infuse additional flavour while steaming by adding ingredients like vinegar, beer, or Teriyaki sauce to the salted water. Choose a pot large enough to hold all the Crayfish comfortably. Do not crowd them. Add the Crayfish one at a time, cover pot, and start timing. Halfway through, lift the lid (careful – the steam is hot) and shift the Crayfish around so they cook evenly. Your Crayfish are done when the outer shell is bright red and when the meat is white, not opaque. DO NOT over cook your Crayfish. Carefully remove your Crayfish from the pot with tongs. Be careful, they are very hot. Note: Your Crayfish will continue to cook a little after you take them out of the pot. To stop the cooking process, place your steamed Cray in a bowl of ice before cracking. Now just melt the butter. You can get fancy and whisk in a little lemon juice in your butter. Cut the Crayfish in half and clean. Season flesh with salt and pepper, then place in a bamboo steamer ready for steaming. Steam the Crayfish for 5 to 7 minutes over a wok of gently boiling salted water. Place half a Crayfish on each serving plate and top with a round of garlic butter, sprinkle over a generous helping of baby greens. Serve. Blanching and boiling will achieve better results when your Crayfish are in a single layer. Be careful not to over pack your pot with Crayfish because it will result in uneven blanching/cooking and generally the Crayfish closest to the heat source will be blanched/cooked to a greater degree than the others. Set up ice baths to terminate the cooking process as quickly as possible after blanching or boiling. Blanching is a common method of extracting the meat from the shell, however the meat is not green. This method slightly cooks the external edges of the Cray and will generally fully cook the leg, knuckle and horn meat. To preserve the greatest degree of uncooked meat, put the Crayfish into boiling salted water (or seasoned court bouillon), and bring them back up to the boil. Immediately after they turn bright red (2-3 minutes) remove them to an ice bath to arrest the cooking. Proceed with meat extraction when they are completely chilled. Geoff's Tip: Add a couple of tablespoons of sugar to the water. It helps sweeten the flesh, especially with larger, tougher Crayfish. 1. Bring a large pot of salted water to the boil with your Crayfish in the pot from the very beginning. 2. When the water comes to the boil observe the following cooking times. To maximise flavour always cook your Crayfish in salty water, so that the flavour of the meat is maintained, sea water is preferred if available. Do not panic if sea water is not an option for you, as salted tap water will be fine. Some chefs will acidulate the water with lemon or vinegar. Others use court bouillon to retain the flavour of the Crayfish. You may wish to add a mixture of wine, vegetables and herbs to the water in order to give the Cray meat more flavour. The residual liquid may also be used to make a delicious stock or sauce. Ingredients that can be added include white wine, pepper, parsley, celery, onions, carrots, or bay leaves. Don't forget to set up ice baths to terminate the cooking process as quickly as possible after blanching or boiling. Remember that just because you remove the Crayfish from the pot does not stop the cooking process. They will still be cooking on the inside until you cool them down. Resist the temptation to plunge the Cray into a sink full of cold water after cooking, as the skin between the body and the claws may have ruptured during the cooking process, filling up the body and diluting the flavour. We suggest you fill the sink with some ice and pop the Cray in, sealed in a plastic bag, so it can cool quickly but stay dry. Don't chill your Cray too long. Serve it at about the same temperature as a chardonnay — which will marry perfectly with its buttery taste. Great care must be taken not to over cook your Crayfish, as this will result in tougher and less succulent meat. Over cooking also means that some of the delicious flavour will be lost and the meat may shrink, become stringy or even mushy. Pan frying is usually associated with cooking Crayfish medallions or steaks and it requires accurate timing to prevent them drying out or over cooking. Roll the portion through extra virgin olive oil, or clarified butter, and season. Pan the portion quickly on both sides on high heat. Remove from the pan to a seasoned small tray, cover with a lid and rest them in 100ºC (200ºF) resting oven for 3-4 minutes to finish cooking. Place them in a box with lid and refrigerate away from the fan. Herbs such as mint, coriander and basil should be added AFTER cooking and immediately prior to serving, as they will go black during the cooking process. You'll find many examples online and in the recipe books of ways to wok cook Crayfish. This is the best! A Chinese restaurant owning long standing friend of John Lawler (JL) gave this recipe to him over 25 years ago. It's still JL's favourite way to cook Crayfish. Several southern rock lobsters (Crayfish), green not cooked. Dissect Cray tail and cut cross ways into medallions with a cleaver. Separate legs and claws etc from main body and disect at joints. Bash hard with cleaver to split. Put corn flour in the bag and give all Cray pieces a very good dusting. Set aside. In a wok, place oil and bring up to very high heat. Best to do on a three ring burner as heat is important. Add the Cray medallions, carefully but quickly, piece by piece and deep fry for about two minutes. Remove and set aside on large plate with absorbent paper. Empty oil from wok and wipe clean. Bring the wok up to gentle heat. Add 1/2 cup oil and onion and cook until soft. Add ginger/chillies/soy/sesame oil and garlic and cook for a further few minutes. Add some salt. Bring wok up to high heat and add the Cray pieces and stir fry all together for about 3-5 minutes. Remove and serve with crusty bread and/or salad. Some prefer basmati rice. Cray can be finger eaten, which is best. Finger bowls on the table are a good idea! Keep all the leftovers as berley for snapper fishing. We hope you enjoy the above suggestions and please feel free to contact us with your own recommendations for your favourite Crayfish recipe for inclusion. There is nothing so rich in flavour as the stock made from a late and lamented Crayfish. So, you must make the soup because the essential flavour of the Cray is best discovered from in a pot of wine and water and aromatic vegetables. Use the shells and excess meat of as many Crayfish as you have cooked. Try to reserve the legs when you cook the Cray for the soup. Clean, then crush the shells into reasonably small pieces. Now proceed to make a Crayfish soup based on one of your favourite recipes. For tips on catching Crays, please see How To Catch Crayfish. I am a diver. This means my mind and heart are sometimes underwater. Thank you for understanding.